The year 2017 marks the centenary of the Russian Revolution. The revolution of 1917 transformed the country and the world, abruptly ending the long rule of the czars, ushering in the Communist era and spawning an ideological confrontation with the West that still resonates. 100 years on, the USSR is a distant memory, but look around and you will still find some traces lingering on in Kolkata. Forget the ubiquitous Chicken A La Kiev (which is not the real McCoy), for a taste of authentic Russian cuisine, head to Milee Droog. The menu at this cafe attached to Gorky Sadan (the Russian cultural Centre) is supervised by Irina Sergeyevna, a Moscovite who decided to settle down in humid Kolkata after getting married. Milee Droog — ‘Dear Friend’ in Russian — is the first cafe in all of eastern India serving Russian food. The walls are adorned with have posters of Kremlin, and the book cases are full of Russian literature. 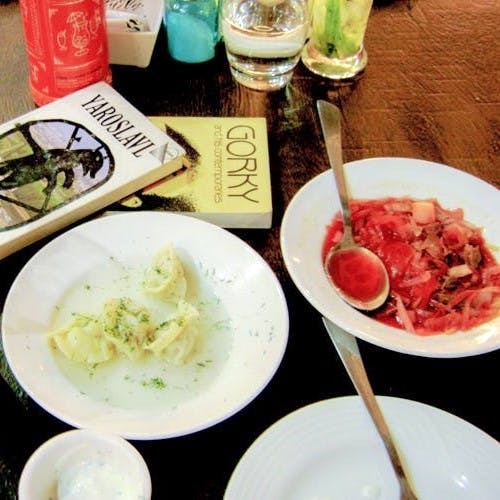 The menu lists an array of Russian food that will have you thinking of cooler Serbian climes – khachapuris, blinis, pelmenis, syrinki, and pirozhkis with tall glasses of really dark coffee. The decor is vintage Mother Russia – with handicrafts like traditional khokloma plates (a well-known style of Russian folk art that derives its name from a village in Central Russia). Khokhloma is one of two wooden souvenirs that can be found in almost every tourist’s bag who returns home from Russia: The other is the matryoshka doll, and a row of these dolls sits on a shelf near the counter. Irina gets annoyed when people mistakenly call these “Babushka dolls”. “Babushka means grandmother!” Matryoshka come from the concept of the mother, babies nestled inside a mama. Russia places emphasis on the matriarch, therefore the popularity of these dolls. Chess addicts in the city swear by the club inside Gorky Sadan, on the busy arterial AJC Bose Road. Inside, a statue of Maxim Gorky adorned with flowers greets you as you walk into the foyer area. Outside in the lobby area, a roomful of children can be found checkmating each other at the Alekhine Chess Club, which was formed in 1976. A few kilometres from Gorky Sadan is Manisha Granthalay, tucked away in a narrow bylane off College Street. You have to weave a zigzag trail through the lanes of College Street, around laden carts, stacks of books, scooters, and a multitude of people, to get there. The bookshop had been launched on May 18, 1964, by the Communist Party of India. Prominent Bengali poet, writer, academic and art critic Bishnu Dey gave the store its name. The logo was designed by Satyajit Ray. And Jamini Roy gifted a painting, which still hangs on a wall. There are magazines and books on science, agriculture, industrial production, sports, and literature. The children’s section is somewhat depleted now, but still makes for a very interesting collection. At an asking price of mostly INR 20-30, the books are a steal. A pertinent reminder of the special relationship between Kolkata and Russia lies beneath its polluted, crowded roads, underneath which runs the Soviet-built Metro line with cool precision. Kolkata was the first Indian city to get a Metro line, with the help of Soviet specialists (and engineers from East Germany) who prepared a master-plan providing rapid-transit (metro) lines which connected the city of Kolkata in 1971. In the old potter area of Kumartuli, you will find artisans crafting statues of Russian leaders, and strewn around the city are plaques in their honour and streets named after them.